For all Facebook Users, you now have access to a full Yellow Page index, with an estimate database of 15 million businesses so far. MojoPages allows you to search any business within any US city. You can go in and write reviews, rate the business, upload photos and videos, give pros and cons, and much more for each business. 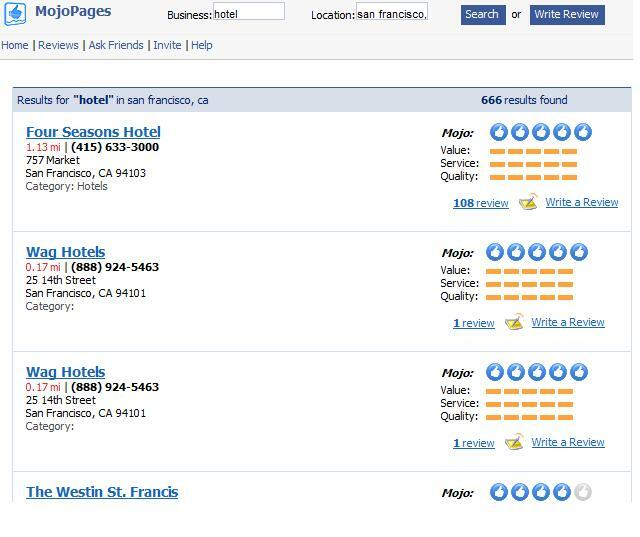 The more reviews a business receives, the higher the listing will show up in the MojoPages results. For our purpose, let’s enhance our client’s hotel listings with reveiws, descriptions of the hotel, pros/cons, photos, virtual tour videos, ect. Thanks for the posting – I will definitely try the review and ratings on yellow page index. You also need to have current reviews of your business on Mojopages as business ratings will also diminish over time – the older the review, the less weight it has over rankings. Great point. This is true for all review sites – the more recent the review the better. So the rule of thumb is to get your guests to leave reviews as often as possible!